I seriously love these things. They’re one bite of crumbly, chocolaty, soft perfection. Yum! I’m kind of addicted to baking mini portions. Just a little addicted (heh, get it? mini, little…). Scones, pies, cookies, cakes… yup, addicted to mini versions of all of those. These little guys are adapted from Small-Batch Baking for Chocolate Lovers. I love these Small-Batch Baking books – you can eat an entire recipe (or share with your husband, if you do that sort of thing…) and not feel horrible. Also, it helps not having multiple dozens of something sitting around the house. The original recipe is for 3 regular-sized scones. I made 12 bite-sized scones because they’re so much prettier and delicate. And because I can. I hear people either like cinnamon with chocolate or they don’t. Hermit said they were ‘dry’ tasting because of the cinnamon. I loved them though. It adds another dimension of flavor I think. 1. Preheat oven to 375°, place rack in middle of oven. Cover a small baking sheet with parchment paper or grease well. Set aside. 4. 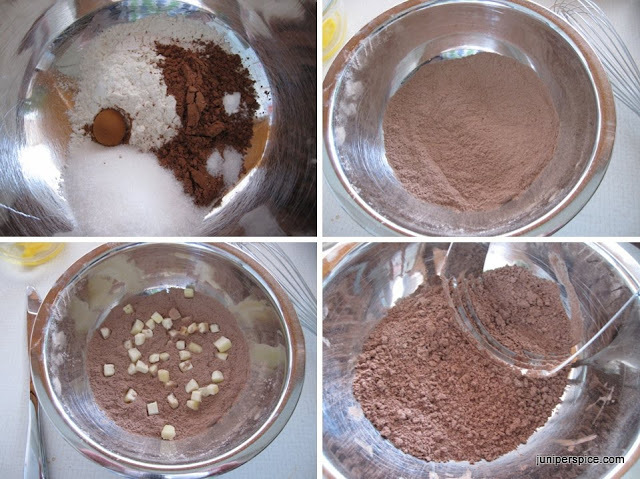 Place the mixture in a medium bowl and create a well in the center. 5. In a small bowl, whisk together the egg, cream, and vanilla until blended. Add the egg mixture to the dry ingredients. Gently mix with a fork just until combined – you do not want to over mix. 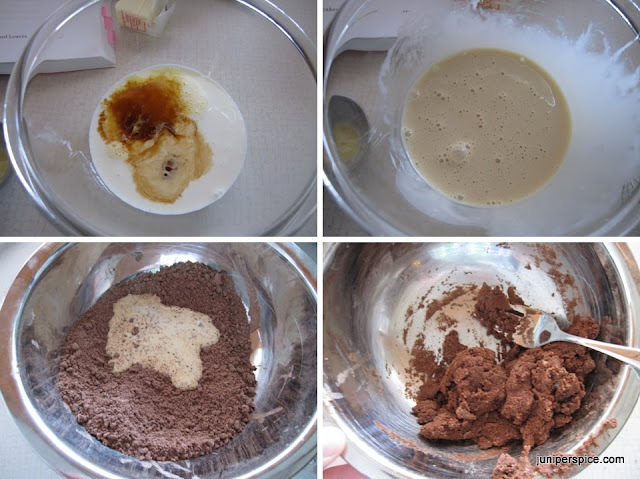 Your mixture should still look a bit “crumbly”. 6. Lightly flour a work surface and your hands; form two equal-sized balls with the dough. Place the dough balls on the floured surface and gently form two discs 1/2- to 3/4-inches in height. With a butter knife or pastry chopper, cut your discs in half and then in thirds, so you have 6 equal pieces. 7. If desired, sprinkle the scones with coarse sugar. With a sharp-edged spatula, gently transfer the scones to the prepared pan and space evenly. Bake the scones until they feel dry and a toothpick inserted in the center comes out clean, about 9-11 minutes. 1. Add the chocolate chips and butter pieces to a small, microwave-safe bowl; microwave 30-45 seconds on 50% power, until soft but not melted entirely. Whisk with a fork until smooth. Add hot water until combined; add the powdered sugar and cinnamon and mix until smooth. 2. Pour the chocolate mixture into a zip-top plastic bag; force the mixture to one corner and secure the top by twisting and holding in place. 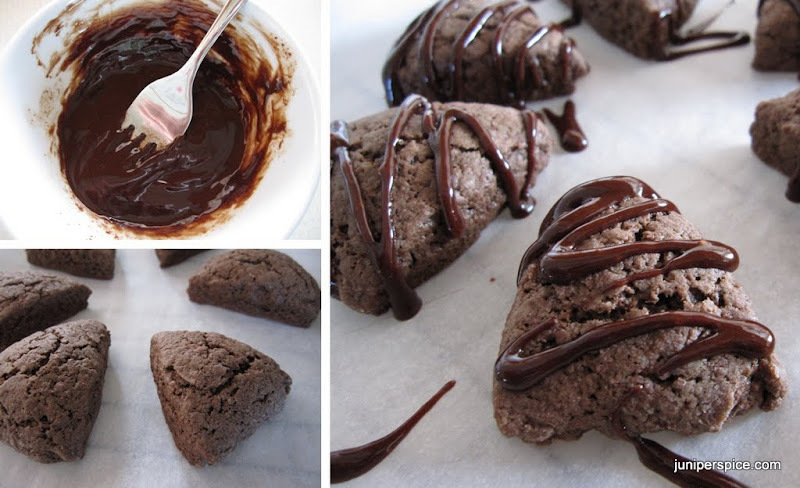 Cut a small piece off the corner of the bag and drizzle chocolate over the scones. Or spoon it right over the top, all gooey and messy. I’m too much of a perfectionist to do this. I need my deserts to be pretty before I devour them. Scones are best eaten the same day, either warm or room temperature. And they’re really good if you eat them all in the same day. What? There are only 12 bize-sized portions. I totally didn’t eat them all the same day. It took 2 days for that. Hermit had one or two. I think.